This post contributed by Sundar Narasiman, Arun Kannan, and Thomas Fuller. AWS recently announced the general availability of Windows container management for Amazon Elastic Container Service (Amazon ECS). Docker containers and Amazon ECS make it easy to run and scale applications on a virtual machine by abstracting the complex cluster management and setup needed. Classic .NET applications are developed with .NET Framework 4.7.1 or older and can run only on a Windows platform. These include Windows Communication Foundation (WCF), ASP.NET Web Forms, and an ASP.NET MVC web app or web API. ASP.NET MVC 4.6 and older versions of ASP.NET occupy a significant footprint in the enterprise web application space. As enterprises move towards microservices for new or existing applications, containers are one of the stepping stones for migrating from monolithic to microservices architectures. Additionally, the support for Windows containers in Windows 10, Windows Server 2016, and Visual Studio Tooling support for Docker simplifies the containerization of ASP.NET MVC apps. In this post, you pick an ASP.NET 4.6.2 MVC application and get step-by-step instructions for migrating to ECS using Windows containers. The detailed steps, AWS CloudFormation template, Microsoft Visual Studio solution, ECS service definition, and ECS task definition are available in the aws-ecs-windows-aspnet GitHub repository. To help you getting started running Windows containers, here is the reference architecture for Windows containers on GitHub: ecs-refarch-cloudformation-windows. This reference architecture is the layered CloudFormation stack, in that it calls the other stacks to create the environment. The CloudFormation YAML template in this reference architecture is referenced to create a single JSON CloudFormation stack, which is used in the steps for the migration. The code and templates to implement this migration can be found on GitHub: https://github.com/aws-samples/aws-ecs-windows-aspnet. Your development environment needs to have the latest version and updates for Visual Studio 2017, Windows 10, and Docker for Windows Stable. Next, containerize the ASP.NET application and test it locally. The size of Windows container application images is generally larger compared to Linux containers. This is because the base image of the Windows container itself is large in size, typically greater than 9 GB. After the application is containerized, the container image needs to be pushed to Amazon Elastic Container Registry (Amazon ECR). Images stored in ECR are compressed to improve pull times and reduce storage costs. In this case, you can see that ECR compresses the image to around 1 GB, for an optimization factor of 90%. Create a CloudFormation stack using the template in the ‘CloudFormation template’ folder. This creates an ECS service, task definition (referring the containerized ASP.NET application), and other related components mentioned in the ECS reference architecture for Windows containers. After the stack is created, verify the successful creation of the ECS service, ECS instances, running tasks (with the threshold mentioned in the task definition), and the Application Load Balancer’s successful health check against running containers. Navigate to the Application Load Balancer URL and see the successful rendering of the containerized ASP.NET MVC app in the browser. Generally, Windows container images occupy large amount of space (in the order of few GBs). All the task definition parameters for Linux containers are not available for Windows containers. For more information, see Windows Task Definitions. An Application Load Balancer can be configured to route requests to one or more ports on each container instance in a cluster. The dynamic port mapping allows you to have multiple tasks from a single service on the same container instance. IAM roles for Windows tasks require extra configuration. For more information, see Windows IAM Roles for Tasks. For this post, configuration was handled by the CloudFormation template. In this post, you migrated an ASP.NET MVC application to ECS using Windows containers. The logical next step is to automate the activities for migration to ECS and build a fully automated continuous integration/continuous deployment (CI/CD) pipeline for Windows containers. This can be orchestrated by leveraging services such as AWS CodeCommit, AWS CodePipeline, AWS CodeBuild, Amazon ECR, and Amazon ECS. 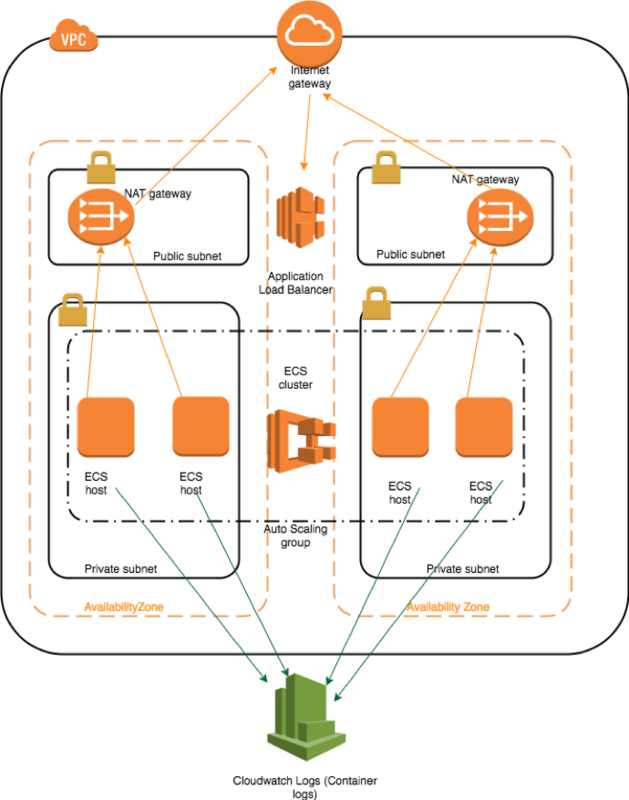 You can learn more about how this is done in the Set Up a Continuous Delivery Pipeline for Containers Using AWS CodePipeline and Amazon ECS post.